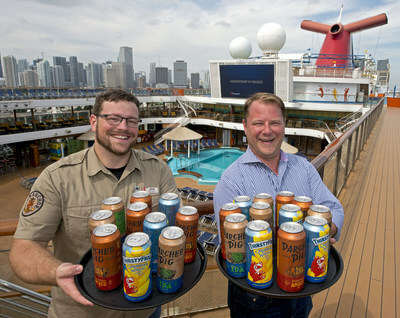 MIAMI, March 18, 2019 /PRNewswire/ -- Capitalizing on the success of its shipboard breweries, Carnival Cruise Line has partnered with Lakeland, Fla.-based Brew Hub to become the first cruise line to can and keg its own private label beers crafted by its in-house brewery team aboard Carnival Horizon and Carnival Vista. The agreement - the first of its kind between a craft beer manufacturer and a major cruise line – was announced Sunday, March 17, at an event aboard Carnival Magic at PortMiami. "With the success of our breweries on Carnival Vista and Carnival Horizon the obvious next step was to let all of our guests fleetwide enjoy our refreshing craft beers and that's where our partnership with Brew Hub began," said Edward Allen, Carnival's vice president of beverage operations. "To be the first cruise line to ever scale up its beverage operations by canning and kegging their own beer is unprecedented. My hope is that our guests will take a four-pack home with them to share with family and friends as a refreshing and memorable reminder of their cruise." ThirstyFrog Caribbean Wheat - an unfiltered wheat beer with flavors of orange and spices. "Carnival's team of brewers have created three amazing craft beers, and we could not be more excited to be working together," said Tim Schoen, CEO and Founder of Brew Hub. "Now passengers on all 26 Carnival ships will be able to enjoy these fresh, high-quality craft beers on every voyage and take some home after their trip." Since introducing the first North American brewery at sea in 2016, Carnival has served nearly 300,000 pints of its private label craft beers to its guests. Much like breweries on land, Carnival's brewery team has also taken advantage of seasonal products and created unique brews like a Miami Guava Wheat and Pumpkin Spice Ale. A brewery will also be featured aboard Carnival Panorama when it debuts in California in December 2019. Brew Hub was founded in 2012 in St. Louis, Missouri, by a team of beer-industry executives and craft-brewing experts led by Tim Schoen. The company's 100,000-barrel Lakeland, Florida, brewery provides full brewing, packaging, distribution and selling services for craft brands that are constrained by capacity, geography or capital. The company's St. Louis Taproom features a 4-barrel pilot brewing system, a distilling operation and a barrel-aging program in addition to a full-service restaurant. To learn more, visit www.brewhub.com or www.tapbrewhub.com.